Ecotrans Recycling has an experienced hazardous materials response team on standby 24/7/365. Our team is prepared to respond to your location for the proper containment, cleanup and disposal of waste materials. Companies of all sizes trust us to manage critical situations in a cost-effective manner that protects the safety of your employees and our environment. 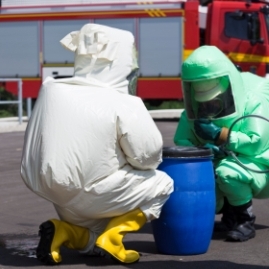 If you have need emergency cleanup or containment please call us at (714) 878-8113. Our hazardous materials response team is on standby 24/7/365. We can handle spills of all sizes quickly to minimize your exposure. Our team is prepared to respond to your location for the proper containment, cleanup and disposal of waste materials. Companies of all sizes trust us to manage critical situations in a cost-effective manner that protects the safety of your employees and our environment.